Extreme Nonsense by Krugman | Watts Up With That? 1. Krugman in Gradual Changes and Extreme Events forgets that there is a threshold on the left hand side, below which cold kills. In fact, in the moderate to higher latitudes more people die daily during the cold months than in the rest of the year. See Winter kills: Excess Deaths in the Winter Months. 2. How does Krugman know that the distribution does not become narrower due to warming? 3. Where is the data that shows extremes have become more intense or more frequent, after one corrects for better detection, increased population, and better communications? It certainly doesn’t hold for cyclones, as Ryan Maue’s ACE graph shows. Events more extreme than any we have witnessed over the past 30 years (or whatever) have occurred before and will, no doubt, occur again, even absent any anthropogenic climate change. 4. Empirical data show that even if extremes are more frequent and intense, lives lost have declined. As noted in the A Primer on the Global Death Toll from Extreme Weather Events — Context and Long Term (1900–2008) Trends, long term (1900–2008) data show that average annual deaths and death rates from all such events declined by 93% and 98%, respectively, since cresting in the 1920s (see Figure). These declines occurred despite a vast increase in the populations at risk and more complete coverage of extreme weather events. 5. Similarly, empirical data also do not show any significant upward trend for property losses once increases in population and assets-at-risk are accounted for. See (a) Pielke, Jr’s weblog on Normalized Disaster Losses in Australia, (b) Bouwer, L.M. (2010), “Have disaster losses increased due to anthropogenic climate change?” Bulletin of the American Meteorological Society, doi:10.1175/2010BAMS3092.1, (c) Neumayer, E., and Barthel, F. (2010), “Normalizing economic loss from natural disasters:A global analysis, ” Global Environmental Change http://dx.doi.org/10.1016/j.gloenvcha.2010.10.004. Spot on, all 4 of my grandparents died in very cold English winters (1946/47-1962/63), like almost all of their 250 forebears that I have traced so far. While I appreciate the rebuttal to Krugman, I am a bit perplexed on why people even take the time to do so. Krugman has shown himself to be a self agrandizing nincompoop. Some point to his Nobel prize as some sort of validation that what he says is to be taken with some type of authority, but he has ventured far afield from his expertise and we all know about Nobel prizes and political agendas. That and 5 bucks will get you a cup of coffee at Starbucks. Having failed miserably at his chosen field, and at any advice given and taken by the real world of economics, Krugman now tries to assert his expertise in fields he has no clue in. Pointing out his mistakes, misconceptions and just plain faulty logic is akin to shooting fish in a barrell. What is exactly the threshold value? 20°C? 30°C? If warmer is more extreme, where goes recent US blizzard, which occurred at low temperature? Is it still a warm-related extreme? If we have extremely cold weather, it is not an extreme? Then cold-related extremes should diminish on the graph, when shifting to the right. If these guys are as good in economics as in climatology, run to the hills. Excellent post. In addition, how does Krugman where to draw the “threshold” line. Is it actually a “hard line” above which is disaster and below is no disaster? I doubt it. It would be a gradual transition from one state to the other. A sigmoidal curve would be more appropriate. How many standard deviations above and below the mean would you place this sigmoidal threshold? I would expect far more from a Nobel Prize winning genius. Like Al Gore for example. This is very similar to a sales pitch made by Kevin Trenberth in his AMS presentation a couple of weeks ago. Krugman = Trenberth? Interesting. I understand your puzzlement, but there are still many people who approach Krugman uncritically. Sadly you are quite correct. Place a title or letters by a name, and many otherwise intelligent people swoon in total faith and blind obedience to the holder of those letters. Krugman got his title, but for work that was sadly fatally flawed, in a field he no longer pontificates on (since his work is virtually useless and void). Yet the title will make others heed his words as if he was the second coming of the messiah. Even if a higher probability of extreme weather is a fact (which it is not), you still have to show that there has been extreme weather in Egypt where the riots occured. Mega storms in the US or heat waves in Russia have littlte effect in Egypt. The causal link is broken when looking at actual events. Krugman is not going to permit reality to disrupt the pleasure he takes from living in his intricately constructed fantasy world. The New York Times doesn’t have a comics page or the “Funnies” on Sunday. But they do have Krugman. Merely brushing off anyone as “not worthy of a response” invites the return attack of ad hominem. There are not enough hours in the day, but if anyone, even a track record fool, is high profile to others, then it may be worth the effort to contest their views. If Krugman had done the actual spade work here and put some figures on that graph (for each year where data is available) I might give it more consideration. At least we might get some indication of whether the distribution curve is changing shape – or not. Then we could start arguing about the threshold. Without giving some real world parameters this is just a meaningless sketch based on pure conjecture. Mega storms in the US or heat waves in Russia have littlte effect in Egypt. I find it interesting that, reading all 13 comments that are available to me (at the time of this writing), ten are ad hominem attacks in one form or the other. This is supposed to be a science blog. Indur, you’ve raised some valid points. Have you posted them at Krugman’s blog, and asked for him to respond? I feel pretty confident that he’d be willing to take them on. (More likely, some of his readers there will respond to you with scientific arguments.) In fact, having been a reader of Krugman’s work for many years, it’s my personal belief that he and they are likely to accept much of what you write. 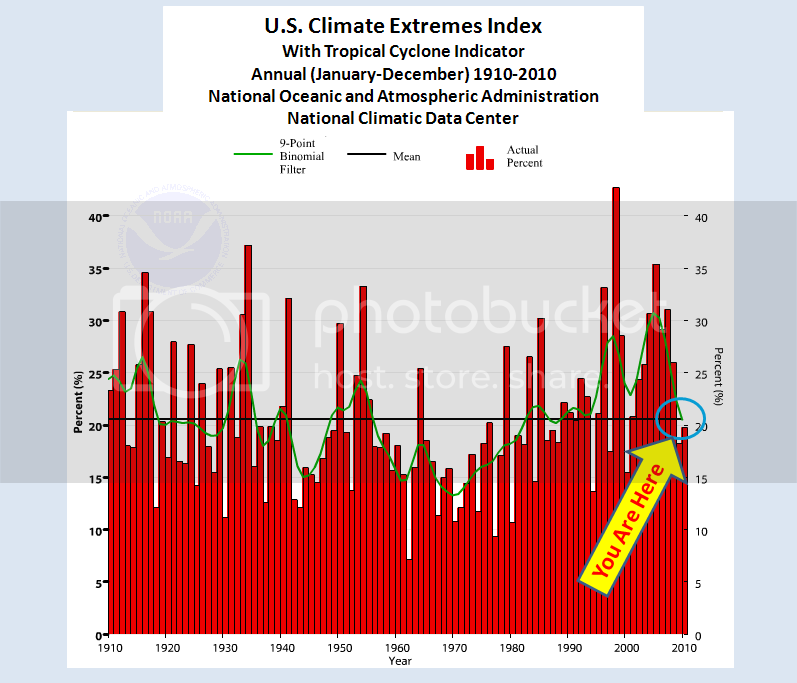 This “Extreme Weather” meme that the Marxist Intelligensia is now spouting off is totally, and completely, unsupported by any facts. It is simply there new talking point to be presented to the ignorant masses as established science. Fact is you cannot compare extreme events, especially such local events as tornados, snow totals (which vary dramatically from point to point in the same storm), high and low tempratures. Even hurricanes could have passed unnoticed before trans ocean shipping was a common, and even then it is quite possible a hurricane could easily be misidentified. If a hurricane forms and dies in the middle of the Atlantic and no one reports it, it didn’t happen as far as human kind is concerned. We know nothing of the weather in say the NE US, especially inland, before 1800 or so, other than you can be sure it was as totally unpredicatable as it is today. Even with sattelite and doppler trying to predict even generalities about thunderstorms is almost hopeless. You can go into the historical record for droughts, floods, severe weather over an entire season or several years, but to claim the specifics can be measured to a single degree, an inch of rain, or x% of crop production is utter folly, and these people know it. Seems like the warmista is the clan to join if you hope to increase your chances of becoming a Nobel laureate. I will become an AGW alarmist if I ever get enough recognition from my reseach to be considered eligible. Sorry gang, but I might have to ditch you for that prize, and party with the likes of Gore, Krugman, and… on second thought, I might stand my ground and accept that I am not (yet?) convinced that the modelers have the climate system figured out. I must end this by stating that the vast majority of Nobel laureates are impressive thinkers. It is then a shame that (especially with Gore, and omg Obama who didn’t even like receiving the damn thing) the prize has been handed out with such blatantly obvious political motives. Let’s hope they can keep the Nobel prize as an institution of meritocracy. If even they can’t, then WTF is the point of aspiring for brilliant achievement anymore? If anyone from “the Team” ever were to win the price, I’d get very sick. The most provocative element of climate science is the damage it has done to scientific virtues such as: curiosity, uncertainty, openness, willingness to be subjected to rigorous review, free from the tyranny of politics and as Weber made clear: Science must be free of “values” (not quite sure how the quote is in English). Krugman’s got to be as thick as two short planks if he thinks it’s as simple as that. It doesn’t exist. I’ve been downloading daily temperature data from around the world. Summer TMax in Canada has been dropping since 1900. Number of heat wave days has also been dropping here. In the rest of the world, there is no evidence that heat waves have increased at all. Didn’t you read Krugman’s other piece of tripe that was recently published in which he asserted that the happenings in Egypt are the direct result of food shortages, which are the direct result of the Russian heat wave, which is the direct result of CAGW? Every once in a while, I read a comment and light bulb goes off. This one flipped that switch. I can see why Krugman is using AGW (or whatever the latest nomenclature is) to explain all the world’s ills. It is because of his incompetence as an Economist and his fervid faith in Obamanomics that makes him blind to see how they are ruining not only our own economy, but negatively impacting economies around the world. If Krugman was honest, he would place the blame squarely where it belongs. As he is not, and is just a whore to a political ideology, he has to find scapegoats. The feebleness of his arguments against the scapegoats is magnified by his lack of belief in what he writes. VEEEERY OT: I just had an idea, and I wanted to share it with WUWT and especially Anthony. It has nothing to do with Krugman. I was wondering if you could have permanent link to “the bore hole” from realclimate.org on this site. If you make it a URL on this site and just copy/paste from RC, then I could read great critical review on climate science without paying the realclimate.org site a visit. Not sure if this is possible, but I feel bad giving RC many hits when I so strongly disagree with their censorship policy. Excellent post. In addition, how does Krugman where to draw the “threshold” line. Since we’re dealing with cold here it should have been on the other side of the hump, for starters…. Given the advances in medicine and technology, I don’t think a simple comparison the totals in the 1920’s to the current total is a true representation. If you look at it per capita, deaths from extreme weather events have actually increased from 2000 per million in the 1920’s to 7000 per million in the last decade. So, although deaths from extreme weather events have declined, it has not matched the overall trend. It doesn’t follow from this that there has been an increase in extreme weather events, but it shouldn’t be discounted as a possibility. Why are Trenberth and his fellow CACA’s(note 1) not following the most recent CACC(note 2) mantra of climate disruption? The new distribution curve needs to be modified to make it consistent with the current climate disruption meme. If climate extremes (moreless snow, tornadoes, hurricanes, rain, sea ice, glacial ice, heat, etc) increase in frequency, then the modified distribution should be shorter and fatter on both the cooler and warmer ends. As others have said, there also needs to be a threshold at the cooler end. This change creates a situation where SNR drops sufficiently to enable policy-based evidence-making to continue. To be honest I feel that your critique of Krugmans article is a bit off. Paul Krugman never even mentioned property damage or human lives in his article. He simply stated that a higher global temperature will cause a higher frequency of extreme events. 1: He does not forget about cold extreme events. In fact, he mentions this several times in the article. 2: When the distribution shifts to the right, there are three alternatives of what may happen: the distribution becomes wider, more narrow or no change at all. The most reasonable would undoubtedly be to assume that there is no change in the width of the distribution. As far as I know, there is no reason to believe that the change of the distribution has a higher chance of becoming narrower than becoming wider. 3: If the number of warm and cold events has not changed, only our ability to detect it, why do you think that we would get a bias toward warm weather? I believe that if that was the case we would see that the number of observed cold and warm events would increase approximately the same. He never mentioned anything about the relationship between lost lives and increased extreme events in this article. In fact, he didn’t mention lost lives at all. You call the article nonsense because of something he hasn’t said. And where is the data where you have taken increased ability to adapt to extreme weather events into consideration? 5: The same goes here. He never mentioned anything about property losses. Please don’t get offended. I’m simply stating my opinion on the matter. I would add that regardless of ones position on climate change it is difficult to dispute that the use of fossil fuels has enabled the global economy to grow faster than the population. This has significantly increased world wealth. As a result even the relatively poorest countries are much better equipped to deal with weather events (right down to forecasting impending storms). Most advocates for addressing climate change purpose solutions that would create scarcity and that would impact the poorest among us the hardest. I often wonder why the press etc. fails to address this at all. A further indicator that cold is the larger problem: Insurance claims are more due to cold weather. At least Krugman’s Nobel wasn’t for Peace (like Al Gore’s). I am still ticked off that Gore won the Peace prize for a mock-u-mentary. If mock-u-mentary=Peace, then the creators of “This is Spinal Tap” really got shafted long ago. Clearly that first, best, mock-u-mentary film did more for World Peace than Gore’s did. I couldn’t put my finger on exactly what it was about Krugman’s ‘analysis’ that chafed me the most, but I think I just have. If ‘extreme’ weather events are at the high-temperature side of his graph, then what is at the low side? …what is at the peak? By trying to throw a normal distribution curve over ‘weather events’, you’re not changing the frequency of any type of event, only the temperature at which it happens. Agreed, Krugman’s article can easily be exposed for the facile finger pointing exercise it is without having to construct straw men. PhilJourdan’s comment above offers a really interesting take on Krugman’s alarmism though. Perhaps the same reasoning could partly explain the wholesale adoption of AGW (and denial of the obvious flaws in the hypothesis) amongst the political class too? Carbon Dioxide makes a great whipping boy..
Well, as I have stated many times here, on a givn northern summer day; the total range of extreme Temperatures on earth can range from as low as -90 deg C (-130 deg F or 183 K) to as high as +60 deg C (+140 deg F or 333K) on the surface or higher on some blacktop surfaces. And every Temperature in that total 150 deg C range can exist somewhere on the earth at the same time, in fact at an infinity of places. But, the actual official records at formal reporting stations, of about +136 deg F and -128 deg F or so, were recorded many many years ago; and they still stand. (google them up for yourself). So nyet on more extreme weather; or those records would be busted all the time. And people survive at both of the places where those record extremes were recorded; and we go into fits over a one deg F warming (maybe) in 150 years; nutz ! He does? Where? And what does he say about it? Does he agree that extreme events induced by warm weather will be offset by extreme events by cold weather assuming constant width of the distribution? As far as I know, there is no reason to believe that the change of the distribution has a higher chance of becoming narrower than becoming wider. 1. Actually, for an uninformed person “there is no reason to believe” anything at all. And all of mankind is certainly uninformed about this issue. 2. If the distribution becomes more narrow, then there will be less extreme events from both warm and cold – thus lives will be saved. If the distribution stays the same (which you are assuming), then the increase of extreme warm events will be offset by the extreme cold events – thus lives will be saved. This is exactly why the CAGW narrative pushes the fact that CO2 will increase the distribution width – hence the name change to climate disruption. They’re doing this because it’s much more difficult to disprove. Could Dr Krugman be part of a team of magicians? And is it possible that his role in the performance is to serve as the distraction so the audience doesn’t see the sleight of hand going on somewhere else on stage? Just wondering. Just a quick question: If the distribution is supposed to represent, say temperature, if I consider the temperature distribution in my upstate NY home town over a one year period, that would be on the order of 100 degrees F wide. Onto this if you add a second curve with a shift of say 0.7 degrees, the ballpark figuure thrown about by AGWers, the two would be almost indistinguishable. So why does Krugman’s curver look more like a 20 degree shift? Meanwhile we are still being force fed AGW claims for increased warming targets being missed due to government inaction. As some have already noted, Krugman’s flaws of logic point to a political agenda and his omission of some of the details are not necessarily sloppy work but quite intentional. Rebuttal of his ideas lets the sunshine in. Surely the more fundemental question is: Where is the evidence that “extreme” weather events are Gaussian distributed? The Earth’s average surface probably warmed by 0.8°C (+/-0.2°C) from 1880 to 2010… Rao et al., 2010 demonstrated that 40% of the warming was driven by GCR modulation of cloud cover; that leaves 0.5°C (+/-0.2°C). Spencer & Braswell, 2010 showed that the climate sensitivity to a doubling of pre-ndustrial CO2 is ~0.6°C – So, the rise in CO2 from 280 ppmv to 380 ppmv could have only caused 0.2°C of warming; that leaves 0.3°C (+/-0.2°C)… Anyone doubt that HadCRUT3 and especially GISTEMP have margins of error (AKA built-in operator-induced warming) of at least 0.3°C ? On top of all of that… If at least half of the CO2 rise since 1850 is natural (as Beck, 2007 and the stomata data indicate)… Anthropogenic greenhouse gas emissions might have caused as much as 0.1°C worth of warming since 1850. Don’t be naive. The whole thrust of Krugman’s piece is “more warm=bad”. There is no “threshold” at the lower end because he is only interested in “more warm” which equals “bad”. No, he doesn’t spell out that there will be more deaths or more disasters. He does spell out that there will be more “extreme events” by which he means more times when the temperature is to the right of his self-determined “threshold”. But a high temperature per se is not an “extreme event”; it’s simply a high temperature. And there is ample evidence that his contention that we are already seeing more frequent “extreme events” on the back of a temperature rise too small for the unaided human being to detect is totally wrong. I consider the temperature distribution in my upstate NY home town over a one year period, that would be on the order of 100 degrees F wide. Onto this if you add a second curve with a shift of say 0.7 degrees, the ballpark figuure thrown about by AGWers, the two would be almost indistinguishable. Excellent point. Someone (including me) should graph this and show what it looks like. That’s not happening. The number of hot summer days in Canada is DROPPING, while the number of severe cold days is also dropping (less cold in winter). Yearly TMax and TMin is converging in Canada. Heat wave days ae falling, most of recordsetting hot days are before 1950. Since the topics has broadened a touch, I hope it’s not too much off-topic to note that that respected intellectual Prince Charles has just warned us off again. Why don’t we see the error of our ways? I know I shouldn’t sneer but may I be forgiven because we have here a man, immensely rich and privileged who on no persuasive evidence, is in effect telling the poor of the world not to expect better. He doesn’t like growth. I would think that if “Global Wrrming” due to CO2 were true, the cold end of the extremes would less likely. For example, if the average temperature of the Earth were to rise to 50 degrees C, the chances of any snow would be zero. What could be simpler than his graph. He has done a lot of reading lately so he knows what he is writing about while giving no indication of his sources. What could be simpler than that except for the opinion of those who commented to the article in the NYT who think it is that simple and Krugman is right. Anyone questioning why there should be a rebuttal can find the answer in the NYT comments to the article. Climate change advocates are losing the public support needed to legislate and regulate the Western world out of its wealth and productivity and Krugman is attempting to salvage the cause. If you look at it per capita, deaths from extreme weather events have actually increased from 2000 per million in the 1920′s to 7000 per million in the last decade. Right there on the graph, e.w. deaths/million dropped from 241 in the 20s to 5 in the last decade. KW is smoking something neurologically lethal, obviously. That’s a lie! They are written by his cat. Oh, about shifting the distribution: Krugman moved the whole thing, bringing up the cold tail, which amounts to asserting that there would be fewer extreme cold events. That’s different from spreading the distribution to the right and leaving the bottom end in place, or flattening the curve. I’m afraid Dr. K. has gone off-script, and is ad-libbing his lines. Baaad Paul! Obviously Krugman cannot interpret his own graph correctly. If the distrubution has shifted as he suggests, the graph clearly shows there will be a decrease in the probability of an extreme cold event, and in increase in the probability of an extreme warm event. BTW, That igNoble Prize for economics PK got was clearly political. The conclusions he drew are demonstrably false, but they do give Marxist Economic Theory a patina of mathematical support. The existence of sub $400US Computers is all one needs to prove that PK is a moron. So I know what a temperature scale looks like, even one without numbers; but it gets a little iffy wondering what scale is used for the probability density. So is the Y-axis linear or logarithmic or exponential or is a a “probability” scale or what. In any case; I would almost bet that NO Physical Phenomenon, ever observed, plots as a graph with that shape. For a start, the probability vanishes (0) right at x = 0, so presumably x relates to T in Kelvins, and then magically, there is an extreme upper Temperature beyond which nothing can ever go. So what is the Physical explanation for a probability that collapses with constant slope to zero at some specific high Tempertaure; what prohibits ANY higher temperature from ever occurring. So this is like the “Laffer curve” of tax revenues versus tax rates. Every person, who can spell taxes, knows that at Zero Tax rate, the Government tax receipts are exactly zero. It requires proof of sanity, to know that at 100% tax rate, the Government tax receipts are also zero. Who is going to do anything that is 100% taxable. So all sane people know the two end points, 0,0, and 100,0 of the Laffer curve. No person; even Laffer himself, knows ANY third point on the Laffer curve; it is believed that all such points have positive y-values; but nobody has any idea of the shape of the curve or where the maximum is. 6. Krugman assumes that the reference period (1950-1980s temperatures or so) are the climate optimum. In reality and history, this optimum (if it exists) should have been at higher temperatures we haven’t reached recently (and hardly will in the future) with green Sahara, oversupply of global food production, etc. Then we would have been moving from more extreme weather to “normal” and not otherwise. I have read many of Paul Krugman’s theoretical papers and books. Paul Krugman is a brilliant mathematical economist who has made important contributions to the areas of trade theory, urban economics and the geography of regions. His Nobel prize in economics is richly deserved. That said, I cannot for the life of me understand why such a brilliant, logical thinker debases himself and his accomplishments by writing thinly thought out pieces such as this one here and his recent tripe about food prices and global warming. Notoriety and money, I suppose. For one who has long admired Krugman for the clarity of his economic thought, the muddled garbage he is now pouring forth is distressing. The Nobel Prize is worth only what the paper it is written on is worth which in the US happens to be green. Notice how Krugman’s blog post is titled, ‘Conscience of a Liberal’. Conscience? Does anybody see anything here? He could’ve titled it, ‘Thoughts of a Liberal’ or, ‘Viewpoint of a Liberal’. But nooo, he arrogantly uses the word ‘Conscience’ in a self descriptive manner as if he is morally superior due to his liberal viewpoints. As for the silly graphs they mean nothing. Where is the explanation for ‘why’ extreme weather events should become more common other than the use simplistic graphs with no plotted numbers? But then maybe he doesn’t need to cause, heh, he’s got a conscience. It is the most honest part of his post! Just Think about it: conscience. Con-science. Science from a conman. I applaus this honesty. The claim that the climate is becoming more extreme may be due to looking for harsher weather at the present time. What we do not look for is weather harsher climate was more common in the past. Two items from opposite sides of the planet that may be worth exploring. 1. In England, before the advent of refigeration, many of the big country houses had ice houses. Crucially you need a sustained period of cold to obtain sufficient ice, yet the CET does not seem to on average to have temperatures cold enough. Could it be that there were more variability in winter temperatures, as well at it being on average fractionally colder? Examples at Calke Abbey, Derbyshire and Dunham Massey, Cheshire. 2. In Australia, Yasi was not that unusual. There is evidence of super-cyclones hitting every 200 or 300 years. If we detect more extreme weather (that is a big if), there is still the counter-argument that we may be exciting a quiet climatic period, like the 20th century warming was most likely largely the recovery from the Little Ice Age. *applaus was a typo bc of the friggin autocorrect on my iPhone. No no, you guys don’t understand, Krugman is attempting to spur economic growth by first reversing it. If we can knock off 2-4% of the world’s GDP in various carbon scams, sending us into an economic Dark Ages, then our potential for growth will be much higher. I think I see another Nobel in his future. Thanks to the people who pointed to Krugman’s New Trade Theory. Didn’t know about it before. Sounds bogus to me; for instance, many of the projects Japan’s MITI sponsored failed; the 5th gen computers (AI project in the 80ies, Lisp-based) come to mind. If he’s right, China will become the industrial centre for everything; but i wouldn’t hold my breath. So maybe he always had that level of bogosity he is notorious for in his NYT column. Your argument would have been even stronger had you showed us the graphs of deaths-by-month that were presented at the 4th Int’l Climate Change Conference in Chicago last year. Many more deaths in the winter than the summer. This post underscores the real danger we have from AGW hysteria–warming is better and more CO2 is good, so if the alarmists get anybody to change things, it will kill people. We can use that to get FUNDING. The alarmests get at least 100x the m-o-n-e-y that real scientists do, because if something is dangerous, you better study it to prevent it from hurting you. I contend that believing AGW will cause IMMENSE ecological harm and extinctions of species. We need to balance our studies to be safe! Applying the foregoing to Krugman, and Obama also, we have persons who are have considerable intellect, but lack the experience and judgment to qualify them as intellectuals except within scope of their specific expertise, economist and community organizer respectively. They do have the qualifications for fools. In real life, is the curve really symmetrical? Sure, it’s a hypothetical curve, but suppose the curve is skewed to the right or left (it would certainly be left in Krugman’s case). If the peak were to the left of center, there would be less change in probability in response to a given temp change. The problem with hypotheticals is that they are just that–hypothetical. Krugman is there to prop up the offical warming message. Much like the White House Press Secretary (a truly thankless job the past decade) delivers the message with a straight face and takes the questions, irregardless of whether anyone buys it or not, Press Secretary included. Somebody has to do it. You say: The whole thrust of Krugman’s piece is “more warm=bad”. Of course, this is also what I think he is believing. But I really don’t think that is the point of this article. If you ask me the only thing he is saying is that with warm weather it is expected to see a higher frequency of warm weather, and the heat waves will get hotter (compared with today). You might disagree with him if you want, but if you ask me it is completely sensible to assume that warmer climate will create a warmer weather. If he wanted to talk about how bad warmer weather is, why didn’t he simply just put in some alarmist example of dying African children, or whatever? He never says anything in this article about why warm weather is bad, or why cold weather isn’t, he is simply talking about the frequency and strength of extreme weather events. As far as I can see most comments here are actually putting things in the article that isn’t really written. Don’t you think that is a bit dangerous? For example, he didn’t mention a word about the number of lives lost, or the value of property damage caused by extreme weather events, but Goklany assumes a lot about Krugmans opinion on this matter. And people are wondering how he knows where to put the threshold value, when he actually never have said that he knows this. Goklany is criticising Krugman, by saying that lives lost of extreme weather has decreased. Krugman never stated that the number of lives lost has increased! When he didn’t even bring that up, how can you be so sure about what he thinks about this matter? Oh, and sorry about my poor English. I am confused as to how this is a rebuttal to Krugman’s NYT article (http://krugman.blogs.nytimes.com/2011/02/08/gradual-trends-and-extreme-events). In the article Krugman uses the graph to demonstrate that as global temperatures warm we will see a higher proportion of “record highs” to “record lows”. He then states “which is exactly what we do see” and references this article: http://climateprogress.org/2010/02/11/science-meehl-ncar-record-high-temperatures-record-lows. The only other “extreme weather” he mentions is a higher ratio of “100-year heat waves and similar events” (which he doesn’t bother to provide backup for). In this particular NYT article Krugman makes no claim about increased deaths, property losses or cyclones. I don’t think that small temperature differences makes any difference to the probability of extreme weather,mild weather or extreme weather it is just a toss of a coin,over a period of time these extreme variations both hot and cold balance. Professor Krugman offers two new courses . . . If English is not your first language then I apologise but in that case I would suggest that you have missed the nuance in Krugman’s article. He uses the word “event” which in the context of what he is writing, unless he simply means a temperature above his “threshold” (which makes the whole article totally pointless), infers an actual event:- ie, hurricane, flood, or similar misfortune caused by that elevated temperature and which (again unless the article has no point) in some way detrimental to humanity. There is no evidence that the rise in temperature has resulted in an increase in these “events”. People can easily “freeze to death” due to a lack of heat. People cannot easily “boil to death” due to a lack of cool. Before, the 1950’s most of the world survived very well without air conditioning. Indeed, we are near a tipping point with CO2 at the present 390 ppm. That tipping point is 90 ppm at which photosynthesis ceases and this green world as we know it would come to an end. In some greenhouses CO2 is injected to keep levels at 1,000 ppm which plants consider nirvana. Does Krugman acknowledge the relationship of CO2 and temperature for the last 5.5E8 years as documented by Berner and Scotese? Is Krugman aware that there is absolutely no relationship between CO2 and temperature for this geological period? I’m confused about Goklany’s point #4, in which he offers what he seems to think is a criticism of Krugman’s claim. Krugman claims that as global average temperatures increase, the probability, and hence frequency, of “extreme events” will increase as well. 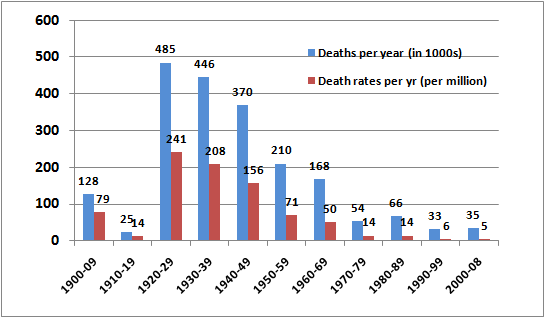 Goklany’s point #4 is that the number of deaths resulting from extreme events has sharply decreased since about 90 years ago. But what does that have to do with Krugman’s claim about the frequency of extreme events increasing? Krugman made no claim about the frequency of deaths. And point #4 seems to have no bearing on the claim that Krugman in fact made. Is Goklany trying to define an extreme event in terms of “number of lives lost”? If so, then he’s clearly not addressing Krugman’s claim (with point #4). And if not, then I’m not clear on how this is relevant. What have I missed? 1) It ignores the threshold for cold events. It shows only the threshold for warm events. There should be a threshold on the left as well as on the right. According to his graph, there are no extreme events associated with low temperature, which is plainly false. 2) Also, the shape of the probability distribution assumes a normal distribution, which is not realistic. Cold kills more surely than heat because of energy requirements. Typically you need a fire to keep warm, and only water to keep cool. temperature rises of 15-20 C occur from winter to summer. Strong weather systems thrive on temperature contrasts which, of course, happen in winter months, not the result of overall warming. Given the advances in medicine and technology, I don’t think a simple comparison the totals in the 1920′s to the current total is a true representation. If you look at it per capita, deaths from extreme weather events have actually increased from 2000 per million in the 1920′s to 7000 per million in the last decade. So, although deaths from extreme weather events have declined, it has not matched the overall trend. It doesn’t follow from this that there has been an increase in extreme weather events, but it shouldn’t be discounted as a possibility. I suspect those 7000 include deaths from the Indian Ocean tsunami of 2004. About six (??) months ago there was a discussion on WUWT (I think it was here) when some alarmist organization tried to pull that fast one, lumping tsunami deaths under the term “natural disasters” and then using equivocation to shift the pea to blame AGW. An “extreme event” is a synonym for a catastrophe, a catastrophe implies lost lives and property damage. Yes, and remember that all the points on the curve are radiating to space by T^4. Those on the right end are radiating a LOT more than those on the left. That curve is VERY resistant to being shoved to the right, and the farther a point is to the right, the harder it is to move it further. Thus the curve will get narrower as it heats up. I suppose you could (a) stipulate that that’s what you mean by “extreme event,” or (b) argue that that’s what everyone ought to mean by “extreme event.” But (a) is irrelevant to Krugman’s claims. He defines an “extreme event” as “a case in which the temperature exceeds some threshold.” So talking about the number of lives lost doesn’t engage Krugman’s argument (hence my comment a few posts up). As for (b), well, let’s see the argument. I think you are missing the effect on spatial components and oversimplifying the issue. The warming of the Arctic has impacted the Arctic Oscillation, pushing it into negative mode more often. This has created more extreme snow events in parts of the Northern Hemisphere in the winter time, including the US. Let’s put the stats aside for a moment and ask a more fundamental question. What is the scientific basis which supports the ASSUMPTION that a warmer earth will have more extreme weather events? I never see the scientific explanation of why this should be true, and if one stops to consider for a moment, the science says a warmer earth should have LESS extreme weather events. Consider some simple facts. The first is that as the earth warms, cold regions warm more than hot regions. Break down GISS or HadCrut by latitude and you will see exactly that. The temperatures in the tropics over the entire temperature record are almost exactly the same. Temperatures in temperate zones have increased more and in arctic zones still more. Which is EXACTLY what Stefan-Boltzman says should happen, regardless of what is driving it. This applies to daily and seasonal temps as well. Daily lows increase far more than daily highs, and seasonal lows increase more than seasonal highs. Now onto the second fact. Where exactly do people thing weather events, extreme or regular, come from? Fact is they come from energy flowing from high concentrations to low ones. Example, what is wind? It is air moving from high pressure (high energy) zones to low pressure (low energy) zones. What makes the wind blow extremely hard instead of softly? THE DIFFERENCE IN PRESSURE (ENERGY) BETWEEN THE ZONES. The greater the energy DIFFERENTIAL the greater the weather “event” that accompanies it will be to redistribute energy more evenly. Now let us ask, what caused the pressure zones in the first place? Anthony can explain better than I, but the driving factor is the daily heating and cooling of the earth as it spins in space. Heating when facing the sun, cooling when not. So let us now put the science of extreme weather events into perspective and ask what logical conclusion should we draw. If the arctic zones warm faster than the tropics, the temperature differential between them declines. All air currents, ocean currents and other factors driven by the temperature differential between the poles and the equator must also decline. As seasonal lows increase faster than seasonal highs, the seasonal differentials must decline, and hence any weather factors driven by the changing of the seasons must also decline. And as daily lows increase more than daily highs, the daily differentials must decline, and hence any weather events driven by daily heating and cooling must also decline. The assumption of the warmists, which I rarely see challenged, is that higher temperature should simply be likened to a higher voltage in an electric circuit. That would be absolutely correct if there was only one voltage source in the circuit in which case a higher voltage would in fact mean higher current in the circuit. But that’s a lousy and highly misleading analogy. Consider a circuit with TWO voltage sources. Let’s say (and I’ll make the numbers lopsided to illustrate the point) we have a 10 volt source and a 100 volt source. The differential is 90 volts. Now let’s increase the voltage of both sources, but with Stefan-Boltzman relationships in mind. The low voltage source goes up to 90 volts and the high voltage source to 120. Now the differential is 30 volts. One cannot argue that the energy potential in the second scenario is MUCH higher than in the first one, but IT DOES NOT MATTER. The current that flows in the circuit is driven 100% by the differential. Up it to 1,000,000 volts and 1,000,030 volts and you will get the EXACT SAME CURRENT. Back to weather now. Everything we call weather is ultimately driven by warming and cooling which in turn create air and ocean currents, pressure cells and so on. If the world warms, as both Stefan-Boltzman laws of physics require, and as the temperature record itself shows, the earth’s temperature differentials, daily, seasonaly and latitudinaly, decline. The total amount of energy in the system may be larger as a result of warming, but with lower temperature differentials at every level of the equation, the science is clear. A warmer earth means a more stable earth. A warmer earth means less extremes in temperature differentials, and hence less extremes in all the weather processes derived from them. Which is all of them. 1: He [Krugman] does not forget about cold extreme events. In fact, he mentions this several times in the article. RESPONSE: I don’t see it on the curve – do you? May be it was just Freudian slip. RESPONSE: I have a hypothesis that it is more likely to be narrower for the following reason: a good part of weather is driven by the need to reduce the temperature differentials between the warm equatorial areas and the cooler poles. But if, under global warming the increase in temperatures in the polar regions exceeds the increase in the equatorial areas, the temperature differential should decline and winds should diminish. This is only a hypothesis so don’t take it to the bank, but it offers a mechanism for less intense winds (and therefore a narrower probability distribution for winds). RESPONSE: First, I would not disagree that there has been some (unquantified) amount of warming, but do we know that this is anything more than a rebound from the Little Ice Age? A warming over a few decades doesn’t necessarily mean that the distribution has changed permanently in one direction or another. 4 (a): He [Krugman] never mentioned anything about the relationship between lost lives and increased extreme events in this article. In fact, he didn’t mention lost lives at all. You call the article nonsense because of something he hasn’t said. 4 (b): And where is the data where you have taken increased ability to adapt to extreme weather events into consideration? RESPONSE: I don’t recall saying anything about adaptation in this post, but no matter, since my graph is based on empirical data, it automatically incorporates whatever adaptation measures that populations may have availed themselves of. But because adaptation is automatically accounted for, I do not equate the empirical declines in deaths and death rates from extreme weather events to a decline in their frequency or intensity. Incidentally, the above figure includes deaths from droughts, floods, wildfires, slides, heat waves, cold waves, cyclones and other storms. RESPONSE: See response to 4(a), above. BTW, what I was attempting to do in points 4 and 5 was to suggest to the reader that regardless of whether extreme events were becoming more frequent or more intense, in the real world human beings were making them less consequential. In other words, the issue of whether the frequencies and/or intensities were increasing (or not) were really a tempest in a shrinking teapot. Bravo! But I beat you to by a single comment and provided the physical basis at the daily, seasonal, and latitude levels as well. This to me is the real argument. The science says extreme weather should diminish in a warmer world. I keep seeing the warmist assumption of the opposite going unchallenged, and I have yet to see a reasoned scientific explanation to support the assumption. And I don’t think there is one. As a one time electrical engineer I liked the voltage analogy. Indur – thanks very much for the reply. regardless of whether extreme events were becoming more frequent or more intense, in the real world human beings were making them less consequential. In other words, the issue of whether the frequencies and/or intensities were increasing (or not) were really a tempest in a shrinking teapot. That helps to clarify what was going on – it was clear that #4 and #5, as they stood, did not really engage Krugman’s point, which was that if average temperatures increase, the frequency of “extreme events” will increase. It seems you didn’t mean to engage that point, and meant instead to argue that even if Krugman is right, it wouldn’t matter much. No doubt you agree that all else being equal, increased frequency of extreme events will cost lots of money and lots of lives (i.e. compared to the money and lives that would be lost without that increase in extreme events)? If you grant that (seemingly uncontroversial) ceteris paribus claim, then there seems to be only a Pickwickian – and a bit perverse – sense in which we’re talking about a “shrinking teapot,” don’t you think? Furthermore, the cogency of your points #4 and #5 depends also on how much you think we should care (granting for the sake of argument, as you do in #4 and #5, that Krugman is right) about this “shrinking teapot.” A quick perusal (perhaps you know some better sources) indicates that typical annual losses due to extreme weather events is in the multiple tens of billions (US dollars), and tens of thousands of lives. I’m not sure what you would consider “consequential” costs in human life, capital, development, or opportunity, but given that we’re not talking trivial numbers, why characterize such costs as unworthy of the concern which you believe Krugman enjoins us (in “code”) to have? Um, this was Krugman’s approach. We are merely commenting on his approach. How is jorgekafkazar oversimplifying anything? I can understand how your simplified view would work if the temperature increase was universally consistent throughout the system, but it doesn’t happen that way. The temperature increase is initially localized and must diffuse from there. If the warming is being driven from the atmosphere down, the temperature difference between the ocean depths and the troposphere is initially going to grow and remain larger for a long time (from the perspective of a human life). The heat capacity of the atmosphere is nothing compared to the oceans. You can’t expect a 1 C temp increase in the troposphere to translate into a 1 C temp increase to the ocean depths for decades. jorgekafkazar says: Yes, and remember that all the points on the curve are radiating to space by T^4. Those on the right end are radiating a LOT more than those on the left. That curve is VERY resistant to being shoved to the right, and the farther a point is to the right, the harder it is to move it further. Thus the curve will get narrower as it heats up. eadler says: I think you are missing the effect on spatial components and oversimplifying the issue. The warming of the Arctic has impacted the Arctic Oscillation, pushing it into negative mode more often. This has created more extreme snow events in parts of the Northern Hemisphere in the winter time, including the US. I suppose you could (a) stipulate that that’s what you mean by “extreme event,” or (b) argue that that’s what everyone ought to mean by “extreme event.” But (a) is irrelevant to Krugman’s claims. He defines an “extreme event” as “a case in which the temperature exceeds some threshold.” So talking about the number of lives lost doesn’t engage Krugman’s argument (hence my comment a few posts up). You’re correct, I should have been more careful in phrasing my criticism. I didn’t bother to read Krugman’s actual article and instead relied on what I remembered him saying elsewhere. Krugman is on a roll. Over the weekend, he wrote “Soaring Food Prices – Blame the weather.” As I was preparing to post a rebuttal to that poorly written article, another article appeared today which was much better written, “Droughts, Floods and Food.” [at http://www.nytimes.com/2011/02/07/opinion/07krugman.html?partner=rss&emc=rss ] Today’s article took into account some of the factors he overlooked in the first article in which he took a very small part of the global grain production story (wheat), region (FSU), and factor (weather) and drew a sweeping conclusion. Krugman: Why is production down? Most of the decline in world wheat production, and about half of the total decline in grain production, has taken place in the former Soviet Union [FSU] — mainly Russia, Ukraine, and Kazakhstan. And we know what that’s about: an incredible, unprecedented [NOT!–RK] heat wave…. it sure looks like climate change is a major culprit. And it’s not just the FSU: extreme weather elsewhere, which again is the sort of thing you should expect from climate change, has played a role in bad harvest[s] around the world. Krugman: Back to the economics: if you want to know why we’re having a spike in food prices, the data suggest that the key cause is terrible weather leading to bad harvests, especially in the former Soviet Union. In terms of immediate fatalities you are correct, but you are responding to an argument that is not being made, by Krugman or others who are concerned about the impact of global warming/climate change. The problem now is habitability of areas impacted by drought and floods, combined with population increases. Climate refugees are going to be more numerous, and this will increase misery and instability. Problem areas are evident in Africa and Asia already. Warming will substantially expand habitable areas, lessen extreme events, and even green the deserts (currently the Sahel/Sahara is shrinking fast). So, per usual, none of what you say is even facing the same hemisphere as the truth. Climate refugees are going to be more numerous, and this will increase misery and instability. Problem areas are evident in Africa and Asia already. Why would climate refugees be more numerous? The number of climate “events” will be the same. Why are you so slow to grasp this concept? Wobble: eadler was replying to Goklany’s points 4 and 5, in which Goklany has made clear that he was assuming, for sake of argument, that Krugman may be right about an increase in the frequency of extreme climate events, but denying that such an (hypothetical) increase would be problematic. Eadler was suggesting that, given the same premise which Goklany accepts (for sake of argument), an increase in extreme events would be problematic. So, as you can see, your reply to eadler isn’t at all on point, since you simply deny the hypothetical premise that is not in dispute between Goklany and eadler (at least in this particular context). Make sense? Personally, I think the worry is due to the sheer terror of uncertainty. The weather models going 20+ years out are still a shot in the dark. If all people can predict is “well, things will change, but we don’t know exactly what changes will occur where” that makes leaders and corporate tycoons very, very nervous. And yes, I said “weather models”, not “climate models”. Because the amount of food that gets from the soil to your mouth (or the mouth of the cow that you’re going to kill and eat) depends on this year’s weather, not this year’s climate. Industrial civilization doesn’t turn on a dime. Decades upon decades of capital investment have built the infrastructure that houses consumers in one location and farming in another. If arable land area simply expands in response to climate change, great! But if arable land area shifts due to climate change… who knows who will get screwed? It would be amazing for the badlands of Arizona and New Mexico to become arable again, but what if the central United States becomes simultaneously less arable? Even if the total arable land area increases (meaning more food production SOME DAY) there would be losses to food production in the short term while the infrastructure is built. Worse, if there is a sizable percentage shift between arable land areas of entire countries – well if that goes on too long, it usually means war. All of which is speculative. There is a model or study out there for everyone’s nightmare. When a large number of wealthy, intelligent people find themselves in a situation where their intelligence and resources don’t guarantee protection of their wealth, they panic. And that rolls down hill. Brian, thank you for your comments (on February 9, 2011 at 9:55 pm). First, with respect to your last para, you should note that I did not say “inconsequential” or “not consequential”, rather I said “less consequential” (which is not quite the same thing). In any case, let’s consider how rapidly the pot may be shrinking. With respect to deaths, which I would say is of paramount importance, the figure above showed that in the 80-year period from the 1920s to the 2000s, death rates declined by 98% — almost two orders of magnitude. It would, therefore, not be unusual to see a similar decline worldwide by 2100, particularly if everyone is a lot wealthier than today (which is the basic assumption in the IPCC emissions scenarios which determine the magnitude of projected global warming) provided we continue to do what worked in the past (and not persist doing what didn’t). These include continuing to amass wealth, developing and/or maintaining transportation and communication networks, satellite monitoring systems and tools to improve weather forecasts (etc. ), and enhancing peoples’ ability to respond on their own. So both absolute number of deaths and death rates from extreme weather events (EWE) should be much smaller in 2100 than they are today, perhaps by an order of magnitude. So on both counts, deaths from EWE would be “less consequential” than they are today. These seem to be growing along with wealth, although there are a couple of new papers by Mendelsohn and co-workers done for the World Bank (that Pielke Jr’s site provides links to) which suggest that they may grow less rapidly. Regardless, I would be pleasantly surprised if they didn’t continue to grow in absolute terms. How so? First, when people feel physically safe and less at risk of losing their lives, they become, in my opinion, more prone to take risks with their property. This risky behavior is further compounded by the expectation that the government and/or insurance companies will compensate them substantially, if not fully. But a lot of this risk is taken on at one’s option (especially in the wealthy countries). My solution to this would be to not subsidize these folks. For the reasons outlined above, I certainly would not spend these hundreds of billions of dollars annually on reducing global warming. Instead I would spend my resources doing the things suggested above and in eliminating perverse incentives that encourage risky behavior. I would do this because we know for a fact that there will be more EWEs even if global warming does not increase their frequencies and intensities. On the other hand, we have no confidence that if the globe does warm that it will necessarily increase the frequencies and intensities for all types of events. As explained in the above citation, these hundreds of billions annually would be better spent solving today’s real problems (such as reducing the loss of life and property from extreme weather events, infectious diseases, hunger, and access to safer water and sanitation) rather than some hypothetical problems that may or may not occur sometime in the future. Justify bad behavour because the other guy does it is just wrong. One should behave well because it is the right thing to do independent of what others do. Exactly. The heat capacity of the atmosphere being small, and wind being the primary mechanism by which energy in the atmosphere is evened out, that is where the bulk of extreme weather events are generated. Daily heating and cooling in any given area is at least 10 degrees and often 20 or even 30 degrees, and that is in a single day! The average temperature at the poles is more than 60 degrees below the tropics. And in temperate zones the seasonal swing from winter to summer might be over 80 degrees. And them’s degrees C not those wimpy Fahrenhiet degrees! So as those numbers get smaller because cold things rise in temperature more than warm things, the energy potentials get smaller and the weather events associated with them decline in intensity. Pointing out that over a period of decades the ocean will increase by one degree and that is a lot more energy than a one degree temperature change in the atmosphere is meaningless. Weather is driven by daily and seasonal events, and by temperature differential. If a century from now the entire atmosphere on average, and the entire ocean on average, are one degree warmer, what would that mean to the various temperature differentials? Except that there is no such thing as “average” so you have to go back to the primary weather drivers, daily, seasonal and latitude temperature differentials, which as I already pointed out, are smaller. Hmmm, I could be wrong though, let’s look at data. Get out your globe and start marking all the countries noted for their mild, stable, climates. Gee, look how many are close to the ocean…. Weather patterns generated by deep ocean upwelling will have a larger temperature differential (between the deep ocean and the troposphere) to drive them. Until thermodynamic equilibrium is achieved, which will take decades. Hmmm, Australia goes from suicide-inducing droughts to devastating floods over a course of 3 years… stable? I’m sorry I don’t comprehend. There’s some things I don’t understand. Like for starters, by “troposphere down” I assume you mean from Long Wave radiation? Might I ask how it gets into the ocean in the first place? LW only penetrates a few microns before being absorbed and the energy is almost instantly transmitted back to the atmosphere via evaporation. Or by “troposphere down” did you mean Short Wave? Well SW comes straight from the Sun, and while it does in fact penetrate a few hundred meters of ocean, any ocean temperature variance that results would be due to variations in Solar radiance. Aside from being perfectly natural, if you know of a way to mitigate variations in solar radiance I’d be interested to hear about it. Not to mention that the ocean is ultimately subject to Stefan-Boltzman as well. The warm water will warm the least and the cold water will warm the most, reducing the temperature differentials in the ocean. Further, recall what I said about temperature distribution by latitude. The temperature record agrees with Stefan-Boltzman. One degree of warming over the last century shows up as 4 to 6 degrees at the poles and a massive, collosal, 0.1 degrees in the tropics. The temperature differential to the oceans depths is a miniscule in the very area that generates extreme weather due to the processes you say I don’t understand. As for Australia, good one. You got me. How could I have missed that? Aside from the evidence that Australia has experienced that type of cycle many times in the past, it must only be this last one that is because of global warming. My mistake, I thought we were talking about temperature differentials. Or does flooding cause temperature changes? Or are you arguing that the flooding is indicative of a temperature change? Because if you are, why bother measuring the flooding and arguing that it is symptomatic of temperature change when you can just measure the temperature instead? Perhaps because direct measurement of the data doesn’t support your argument? Not to mention that Australia is a continent, so you started by arguing that increased temperature differential between ocean depths and troposphere would increase extreme weather events propped up by an example of flooding on a continent. I would think you would have chosen as an example to support your argument the increase of extreme weather events over ocean areas subject to the increased temperature differential from the troposphere warming. You know, like hurricanes. Oops I forgot, total cyclone energy has been dropping for the last few decades, probably shouldn’t have picked that one. I know! You could use increased snowfall and record low temps at increasingly southern latitudes, counter intuitive obviously but at least the numbers would be on your side if not the logic. Perhaps you could clarify with some better examples because I have to admit your very short explanation is very hard to follow? Just remember everything in life conforms precisely to a simplified model of reality, just like US house prices. Everyone recognizes that the award of Noble prizes is politically motivated to advance the leftard agenda. Fine. But let’s not pretend that these phony certificates are evidence of any unusual knowledge, expertise, or moral authority. On the contrary. They are tickets to Clown Circus, where buffoons like Obama, Clinton, and Gore caper in fright wigs and baggy pants. Both are wholly disconnected from reality. I wonder if Krugman has any connections to the World Bank (who were chosen at Cancun to oversee the 100 billion “climate change” fund, AFAIK) ..
No, you are giving Eadler too much credit. His statement is not conditional. His statement is absolute. There is no written or implied IF in his statements. Btw, Eadler’s absolute assertion was an attempt to move the goal post after his prior comments were logically debunked. Nope, just meant it exactly as it read. The heat increase in the atmosphere, by whatever method it is heated, must diffuse down into the ocean depths. That diffusion of heat is going to take decades. You keep talking as if these systems were giant block objects subject to simple black body physics. If I light my oven, will the temperature in my freezer rise faster than in my oven? If it doesn’t, has the Stefan–Boltzmann law been violated somehow? Well, no, and that’s why the atmosphere can experience a temperature increase greater than the ocean depths. Whatever the amount, it is greater, correct? And as you pointed out, it is an increase in the temperature differential that drives the process we call weather. So whatever weather was being driven by that temperature differential before will now have more energy available, correct? I called it a simplified view because that’s what it is. There are not lower temperature differentials at every level of the equation – there is an increased temperature differential between the ocean depths and the troposphere. This is key to ENSO, which drives a variety of weather events.